probes for digital thermometers? | Smoking Meat Forums - The Best Barbecue Discussion Forum On Earth! Discussion in 'Meat Thermometers' started by lovesmokin, Feb 23, 2007. All three have stopped working because the probes don't give the signal any more. Probably happened when I washed them. The electronic readout part still works, but the wired probe thingy is broke. Please help!! I'm getting hungry! I only clean my temperature probes with a slightly soapy wet cloth and a little elbow grease followed by a clean wet cloth wipedown. Mine hasn't stopped but it get very erractic when the outside temps get below about 10 degrees. I think the cold upsets the batteries. I'll stick to my dial therometer for winter! Does Acu-rite not sell replacements? Oh, if the instructions say not to submerge, that must be why I missed it. I figured the instructions said something like "turn it on, start pushing buttons, poke that sharp thing in somewhere, sit down and start watching the numbers change." I might try a couple of the maverick probes and see what happens. Be careful not to put them directly over a c'coal fire either. I ruined one that way myself. They won't stand up to that kind of heat. 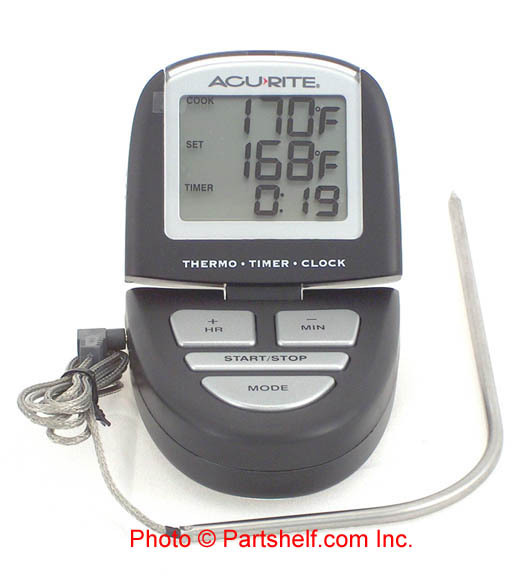 Don't know where you got yours at, but the local WalMart sells Acu Rite thermometers for 9.95, they are the red plastic one. Probably cheaper to buy the whole thing than it is to pay shipping on a probe. I bought one and it crapped out about half way through my second smoke with it (and I didn't submerge my probe), checked and it was made in China with no instruction to reach the manufacturer. I went to Home Depot and bought a CharmGlow remote digital and I love it. Only wish it had 2 probes like the Maverick 73. I have had a problem getting probes for my Taylor's. If you call Taylor, they tell you to call their distributor. What a pain.